There is currently a vigorous debate in the UK about whether shared access to 5G spectrum should be allowed. Much hinges on the expectation of how widely mobile operators might deploy. By examining crowdsourced data on existing LTE deployments, we can gain some insight into how 5G may be deployed. 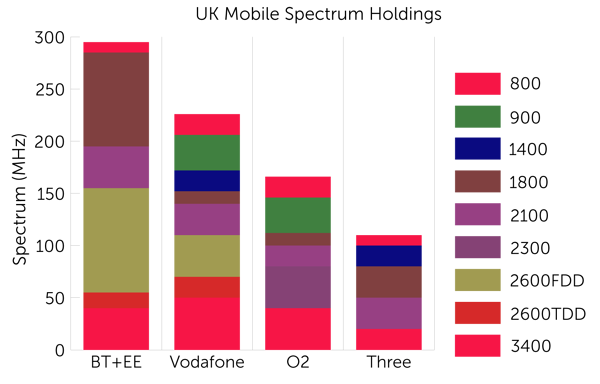 Mobile operators have a range of frequency bands available to them, as shown in the figure below. We have shown in a previous blog how higher frequencies have shorter range, but what can we tell about how extensively each band is used across the country? Here the frequency with the greatest number of locations, 800 MHz, has been set as 100%. We can see that 1800 MHz is seen in almost as many locations, 2100 MHz and 2600 MHz in about half as many locations, and the newly-awarded 2300 MHz in just 1% of locations, reflecting the fact that it is only just starting to be deployed. Interestingly, the TDD part of the 2600 MHz band (the central block) appears unused despite it being more than five years since it was awarded, although it is possible that it is used as an additional aggregated channel in some cases. The 900 MHz “GSM” band is also virtually unused, suggesting it is being cleared of 2G ready for refarming to 4G (or perhaps even 5G). It gets more interesting if we then estimate geographical coverage. We have to be a little deductive to get to this. Crowdsourcing does not directly measure geographical coverage since there will be many locations with coverage where nobody actually goes (arguably, these are irrelevant). However, we can count the number of base stations that each operator has in each band, and we can also deduce the average radius of each set of base stations using the timing advance parameter as described in the previous blog. If we do this we get the following table, where the location percentages have been repeated from above in the second column. Again, 800 MHz is given a ranking of 100%. We know that EE has 90% geographical coverage from data provided by Ofcom, so the 100% relative area equates to 90% landmass coverage. It is interesting how the other bands have vastly less landmass coverage than measurement locations. At 2100 MHz for example, measurements have been made in 55% as many locations as 800 MHz, but covers only 5% of landmass. This shows clearly how the operators, very sensibly, are using the higher frequencies in urban areas where the capacity is needed and where much of the population either lives or commutes to (and hence generates measurements). A case for sharing 5G spectrum? This information is useful for a range of reasons, not least to help regulators and others understand the potential for sharing and other use of the bands. Despite 2100 MHz and 2600 MHz being important for capacity reasons, they cover less than 5% of the landmass, leaving the spectrum vacant in the vast majority of the country. It seems very highly likely that the 5G frequencies at 3500 MHz will see a similar deployment, perhaps with even less landmass coverage given those frequencies' lower propagation range. Making these frequencies available to others, such as building owners or rural communities for self-deployment, would seem beneficial and valuable. This is a topic of much current interest and debate, with countries such as the UK split about whether shared access should be allowed in the 5G band. The data here suggests there is vast opportunity.